That episode of Firefly (Our Mrs. Reynolds). I’m sure you remember it, and how impressed Wash was by the production of fresh bao (baozi, a steamed Chinese bun filled with…well, whatever you want, basically). Perhaps in the depths of space, this is a truly difficult feat, but as I’ve recently discovered, here on earth it’s not the least bit tricky. Ok, that first paragraph was lost on anyone who has never seen Firefly. See, you try to work some local color into a recipe and where does it get you? These are hong (red) dau (bean) baozi–meaning they’re filled with sweet red bean paste. There are a lot of good recipes for this out there. I got the idea from this helpful YouTube video. She’s making anko, which is the Japanese equivalent. This video from Cooking with Dog gives better instructions on how to actually make the paste. The outside of the bao comes from a recipe I saw on Food Network, specifically a show called “What Would Brian Boytano Make?”, specifically this recipe here. Put adzuki beans in a bowl and cover with water. Leave to sit overnight. In the morning the beans will have swelled up and soaked up most of the water. Drain and rinse the beans, then put them in a pot with water to cover (about three cups). Bring to a boil and then reduce heat to a simmer. Let it cook for about an hour until beans are soft. Skim off any scum or thick foam with a spoon or strainer. Drain and rinse the beans and put them in a bowl. You can put the beans in the fridge overnight at this point. That’s what I did (I was tired). When you’re ready, stick the beans in the Cuisinart and chop them up. You’ll probably have to add a little water to get everything to chop up. Make sure the paste is very smooth. It will be kind of a light purple color and not very thick. Add sugar and salt and mix thoroughly. Put two tablespoons of butter (or neutral oil) in a pan. When it’s melted, add the bean paste and stir fry it over medium-high heat until it thickens and darkens. It will be a dark purple color when it’s done, and quite thick. Put it back in the fridge and get the dough ready to go. Add the yeast into the warm water along with a pinch of sugar and set aside. When I say “warm” I mean “less than 110º or you will kill the yeast, but above 80º. “Warm to the touch” is a good indicator. Mix dry ingredients (flour, salt, sugar, baking soda). Add the milk, butter or oil, and water with yeast in it and mix well. Turn dough out and knead about 5-10 minutes. There isn’t much gluten in cake flour, so it won’t ever be quite as springy as regular bread dough, but it will get smooth and thick. Cover dough and let it rise for about an hour, until doubled in size. Mine rose closer to 1.5 hrs, since I went running and showered before I rolled it out. No harm done. Roll the dough into a snake. Divide in half, in half again, and divide each quarter into thirds to make 12 pieces. This will make REALLY BIG baozi. If you want small baozi, halve or even third these. Roll the dough into a ball between your hands, then flatten and roll out until thin. Try to make the edges thinner than the middle. Add a good quarter cup of bean paste and gather the edges together. Pinch the top firmly. Let the baozi sit for ten minutes before you cook them. Start a pot of water going. Alternatively, put water in your rice cooker and turn it on. This is what I did, since our rice cooker has a steamer attachment. If you don’t have a steamer, you’ll have to improvise — try putting one of those racks for cooling cookies across a pot. You’ll want it wide enough that you can get a lid on it, but there has to be water boiling and not touching the baozi. You’ll figure something out. Each baozi can get its own little square of parchment paper. OR you can cut out a big sheet of parchment paper in the shape of your steamer and punch little holes in it to let the steam through. Whatever works for you. Put the baozi in the steamer and steam for about 12 minutes, until the baozi are shiny and cooked. They will expand a lot in the steamer, so don’t put in too many at once. Serve warm! Be careful, the filling will be hot. So that was super easy. You can put basically whatever you want in them. I will probably try spinach and tofu next. 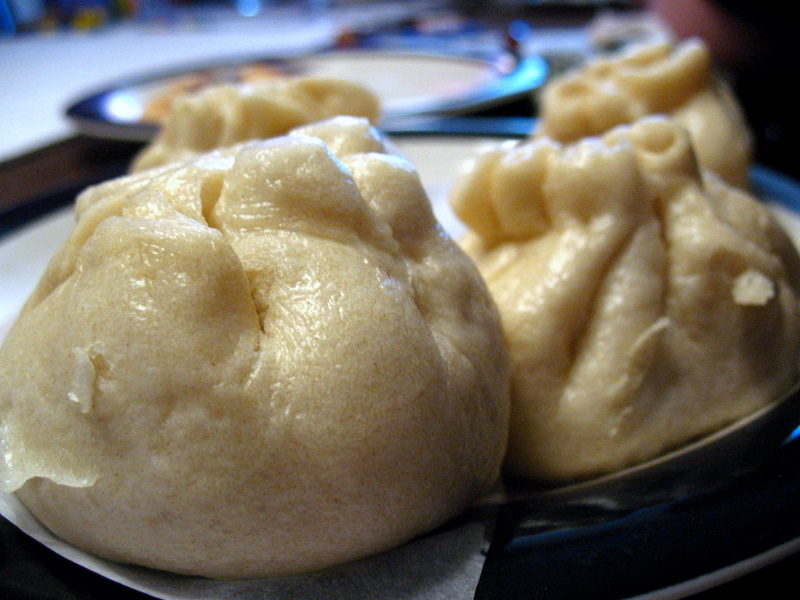 This recipe made about 13 baozi, enough to feed the four baozi eaters with baozi left over. I could have easily made the baozi smaller and made at least 16 or so. If you decide to make this with a more savory filling (I used tofu, cabbage, mushrooms, and green onion), be warned: the wetness of the filling will make the dough very fragile. Don’t roll them too thin, work quick, and consider steaming them seam-side (i.e., thick side) down. Well, I’m knackered, but my computer is now up and running again (Windows 7) after a reformat, and hopefully it will keep going for a long time. Unfortunately, I’ve lost the password I needed to log into the site (Classification Web) where I could look things up in LCC, so the comics won’t be categorized for a while. After winter break ends, I can use the hard copy of LCC or the computers in the library school lab. Based on an actual conversation, and I laughed for a long time. Bryan has a perfect sense of timing. My birthday is actually May 3. I figure since it’s mostly Bryan and my mom who read this, I shouldn’t bother mentioning it. But then I thought maybe I should for those random strangers. I have had this drawn for a couple of days and I’ve been waiting on the re-installation of all my various programs before I could process and upload it. I would have had it up last night, but Bryan’s computer exploded and I went to go play games with him to console him. The things we do for love. I think that’s it. I’m really tired now. Oh, the name of the comic was chosen to be similar to The Bell Jar. Not that I recommend the book, mind. Unless you are a depressed teenager, then it will be awesome. Actually, I take that back. I think it was so depressing I had to stop reading it. So that’s pretty depressing. I’m not one for Xmas cheer, but I’ll close by wishing everyone a happy holiday season. My gift is a trip to Paris and London. I am so excited I cannot sit still. I get to go to Paris! I can run to the Eiffel Tower! We’ll go to London! I’ll see Baker Street! I’m full of exclamation points. If I owe you an email, I’m sorry. Still getting caught up on everything from finals. ETA: Classed as GT2920.C3 L86 2010 for Manners and customs (General)–Customs relative to private life–Eating and drinking customs–Foods and beverages–Beverages–Other, A-Z–Chocolate. Bryan’s friend’s dog came over (long story) to go for a run with us tonight. Last week when this happened, Kali (the cat) freaked out, urinated on me to get me to drop her, streaked up the stairs and was not heard from for another three hours. This week she sat on the sofa and hissed quietly when the dog came near. This was pretty distressing for the dog, who wants to be friends with everyone and who was evidently determined to protect his friend Bryan from the mean nasty bitchy cat, but I think it’s a vast improvement. Em: I’m going to do a comic about your socks. Bryan: My…my socks? That won’t be funny. Aren’t you afraid people will think you’re all domestic? Bryan: The comic is funnier now that I’ve read it again. (pause) I’ve been finding mis-matched socks in my drawer for the last two weeks. 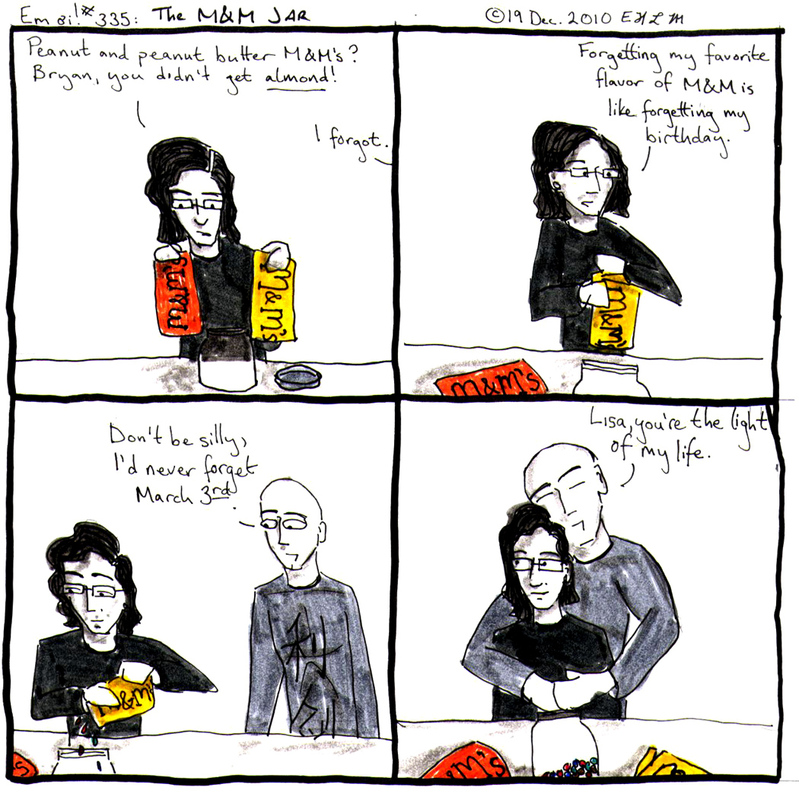 We’ll file this comic under PN6231.S634 L86 2010, for Collections of general literature–Wit and humor–Collections on special topics, A-Z–Socks. I’ve noticed that most bloggers end with questions to try to engage their readers in a dialog and garner comments. So how about this: Do you have any opinions on enumerative versus expressive classification systems? No, wait. Don’t go. Let’s start with something easier, like “How was your day?” I myself swam 2100 yards, cleaned a heinous virus off my laptop, and made truffles out of bad fudge. What did you do today?